You may not have been in that situation but we all know how it goes. That perverse tradition is wrong in so many ways, let me explain why. Egyptians were probably the first followed by the Greeks. But we’re sure about the Romans: the bride would be given a golden ring to wear in public and an iron ring to wear when performing her duties at home. A different ring for different eyes, a clue that the ring was not a token of love but merely an ostentatious object, showcasing the husband’s wealth. What’s an engagement ring for? That didn’t change through time: to signal other males she’s taken. That’s why the girl wears the ring and the boy doesn’t. After all he’s free to look for someone else – the golden ring was a source of financial security for the woman. Some guys even offer a ring right after they start dating the girl. The ring is a warning for TAKEN: Look but don’t touch, much like how humans do with cattle. Why do they need to have a diamond? You could as well ask why Santa Claus wears white and red, but in this case it’s because De Beers wanted to. Who are they? A cartel that mines, trades and sell diamonds for a living. 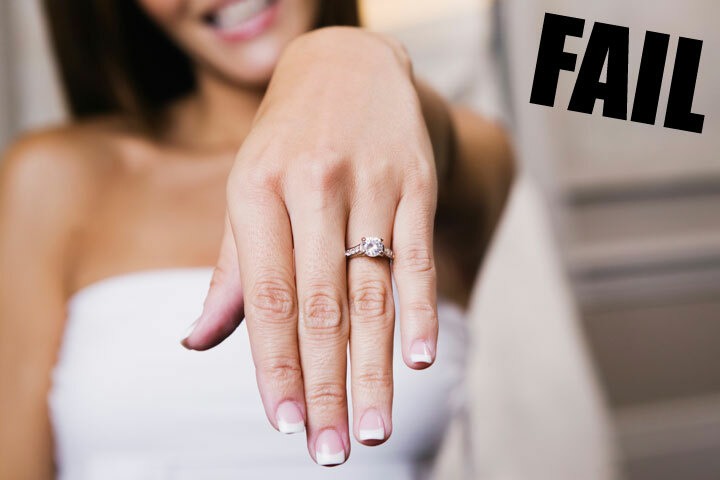 In 1930s they were selling less and less diamonds, so they created a marketing campaign persuading the consumer that an engagement ring is indispensable, and the only acceptable stone is – you guessed it – a diamond. Who cares about women’s taste anyway? Seriously, are you trying to buy her love? That’s what you’re doing. Stop it! You’re on your knees, you’re giving yourself to her. She knows the person you are and the husband you’ll be, that’s enough. You still want to give her a token of your love. Fine, weak soul, buy her a dinner on that restaurant she loves, go on a vacation just the two of you, but please don’t impress her with stuff. If she doesn’t understand that, walk away from the leech.